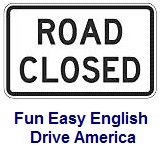 ﻿ Fun Easy English - Drive America - United States of America road signs, rules, and regulations regulatory, preferential. The regulatory road sign preferential only lane designates special traffic uses such as high-occupancy vehicles (HOVs), light rail, buses, taxis, or bicycles. Preferential only lane treatments might be as simple as restricting a turning lane to a certain class of vehicles during peak periods, or as sophisticated as providing a separate roadway system within a highway corridor for certain vehicles. Supplemental plaque - designates the bus lane. Supplemental plaque - designates the taxi lane. Supplemental plaque - designates the high occupancy vehicles (HOV) with two or more people lane. A lane where only buses is permitted is approaching. Buses only are allowed in the right lane, Monday thru Friday from 6:00 am - 9:00 am. Buses and taxis only are allowed in the designated lane, Monday thru Friday from 6:00 am - 9:00 am. Inherently Low Emission Vehicles (ILEV) are allowed to use the High Occupancy Vehicle (HOV) lane regardless of the number of occupants. A High Occupancy Vehicle (HOV) lane, for vehicles with two or more occupants, is approaching. A High Occupancy Vehicle (HOV) lane is ending. A High Occupancy Vehicle (HOV) lane ends in one half mile. The designated lane is a High Occupancy Vehicle (HOV) lane, which allows only vehicles with two or more occupants. The designated lane is a High Occupancy Vehicle (HOV) lane, which allows only vehicles with two or more occupants, 24 hours per day. The designated lane is a High Occupancy Vehicle (HOV) lane, which allows only vehicles with two or more occupants, Monday thru Friday from 6:00 am - 9:00 am. The left lane is a High Occupancy Vehicle (HOV) lane, which allows only vehicles with two or more occupants, Monday thru Friday from 6:00 am - 9:00 am. A High Occupancy Vehicle (HOV) lane is approaching.